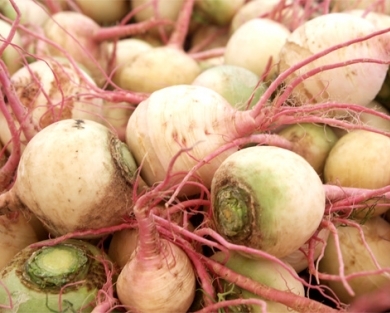 If our market stand is missing watermelon radishes one day, try a large Daikon radish as a delicious substitute. They have a similar, mild flavor and crispy texture. So maybe I obsessively make a version of bahn mi. And maybe it’s vegetarian. So maybe what I really mean is I LOVE eating fresh cilantro, mayo with sriracha, thin sliced jalapeños, maaaaybe some fried tofu, and a TON of this picked carrot/radish mess on a baguette. Is that so wrong? I might have put cheese on it a couple times, but I can neither confirm nor deny that. In any case, I almost always have a jar of radish (watermelon if you want less stinky and more beautiful or daikon if you want to be traditional) and carrot in my fridge. Faux bahn mi or no, they are yummy on almost any sandwich. 1/2 lb. watermelon radishes – cut same as carrots. Empty jar(s) depending on size. You want to be able to cram all of the cut veggies into it/them and get the lid on. 1. Put the carrot and radish in a bowl and sprinkle them with sugar. 2. Massage the carrot and radish. You heard me right, just nice little squeezes for a couple of minutes. Why? Because they’ve had a hard day. I kid. Because the sugar helps the water in the veggies release and makes the veggies shrink a bit. They should get a little more bendy and a little puddle should develop at the bottom of the bowl. Admittedly, this step is easier if you do matchstick cut…just be careful not to completely snap your rounds if you do rounds. Nothing terrible will happen…just will have funny little pickles. 3. Rinse the veggies off. 4. Cram them into a jar/jars. You want a little bit of room at the top. 5. Pour the vinegar and salt in over the veggies. 6. Put a little more sugar on if you want (I don’t…there’s usually some sugar left in/on them, post massage and it’s enough for me). 7. Pour the water in to cover whatever isn’t yet. 8. I usually turn the jars back and forth for a light shake. 9. Put ‘em in the fridge for at least and hour…use within the week (I have used mine for a couple of weeks but I don’t know if that’s a great recommendation ☺). 10. If you want, you can put some red chili flake in the pickling liquid too. For bonus zest and prettiness.